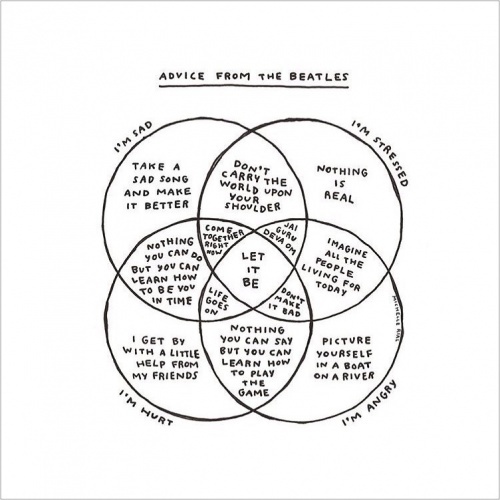 Sometimes, instead of letting it go, it might be a good idea to just "Let it be." In the following excerpt of this absorbing read, Ophelia invites us to explore a shift of vocabulary from Let it go to Let it be. In order to come to terms with the “letting go” epidemic, I had to change the vocabulary. I don’t quite remember where and how my heart started singing this song but when it did, I softened. The song is “Let it be” by the Beatles, written by the magnificent Paul McCartney. I think he was on to something. It’s such a simple tune, yet such a powerful message. This is absurdly far-fetched, but please bear with me on this one, ok? Maybe, instead of forcing change onto our lives by letting go, why don’t we just try to “let it be” and be open to change instead? The great thing about this approach is that this doesn’t require any action from us whatsoever. We don’t need to “do” anything. This intangible “letting go” that you are struggling with because you cannot make it happen? Let it be. Change always comes. We can trust the process. Speaking of vocabulary changes, I feel like we have got to come up with better ways to describe periods of self-reflection and growth other than “working on ourselves”. I think it’s a really awful way of talking about it. It’s just another way we implicitly put pressure on ourselves. We can do better. There will always be times in our lives when we are ready to turn a new chapter, but why so aggressively burn the pages of what is behind us? You might need to revisit these pages eventually or you risk loosing track of the plot entirely. With “let it be”, I have found a more gentle approach. Instead of pushing ourselves to let go of our negative emotions, let them be and engage with them instead. If we are truly honest with ourselves, we know that they are here to stay. They are an intrinsic part of who we are and they are not problems to be fixed. This is something that has taken me a long time to fully understand. We’ve adopted such a linear approach to life that we believe we cannot be ready for something new until we have fully resolved the old. We constantly put pressure on ourselves to “move on” and be “over” things. What does it even mean? Maybe life is just way messier than that. I’m just going to accept that some things are simply never quite over and let it be instead. Instead of slamming the door shut on the past, I’ve adopted an open-door policy, very much inspired by Rumi’s powerful poem “The Guest House“. I have looked at my past with the bright and hopeful eyes of a 20 year old. I’m looking at it with slightly more beaten eyes in my 30s. There’s nothing to do but look forward to having another glance in my 40s, 50s and so on and see how I feel about it all then. I simply don’t know. So I’m letting it be and not going to stress about it. And maybe – just maybe – this can open enough space in our lives to help us find each other again. Let it be. Such a crowd-pleaser is just begging to be sung together. Sometimes we don’t grow by changing our circumstances, but we change our circumstances by growing. We do this by learning to sit with our discomfort, and instead of trying to discharge it, maybe we should try to embrace it with all of our love and see what happens. There will be an answer. Let it be.